Properties in Province of Alicante average 4.5 out of 5 stars. Unique penthouse with a huge private roof teracce, close to the beach. Property 11: Unique penthouse with a huge private roof teracce, close to the beach. Beautiful apartment, located in 5 min. of the beach. Cozy and comfortable. Property 13: Beautiful apartment, located in 5 min. of the beach. Cozy and comfortable. NO EXTRA FEES! ** Perfect Location, South Facing, Pool, Shops,Beach, No Car Req! Property 14: NO EXTRA FEES! ** Perfect Location, South Facing, Pool, Shops,Beach, No Car Req! Property 16: Central apartment, all renovated in 2018. Luxury Punta Prima Apt in quiet secure gated gardens. Walk to sea, restaurants. 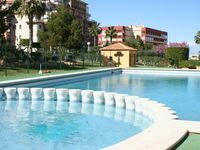 Property 43: Luxury Punta Prima Apt in quiet secure gated gardens. Walk to sea, restaurants. Luxury Penthouse, Close To The Beach Of Guardamar. Property 45: Luxury Penthouse, Close To The Beach Of Guardamar. Think we was the first let of the season as the apartment was a bit musky, but soon cleared with some fresh air. Was met by Chris to hand over the keys, very polite even though we were late back from the airport. The apartment is close to the local strip which has many good bars etc. The local supermarket is just over the road. The apartment itself was very clean and well maintained. Two large bedrooms with lots of storage space for your clothes. Plenty of cutlery etc on the small but adequate kitchen. Lovely gardens at the rear with a nice pool which unfortunately for us was not open yet.All in all an excellent apartment which l strongly recommend &amp; we shall book again. The appartement was nice, well-equipped so we could cook and wash our clothes. It was on a street bursting with bars and restaurants, but double-paned glass kept it from being too loud at night. It was a five-minute walk to the water front and ten away from a beach. We got lost on the way there and our host Maritza was kind enough to wait over and hour and to come guide us to the appartment. Two points: The appartment was quite small. There were only two of us so it was alright but in my opinion two people would be the maximum capacity. Also, when we attempted to pay for our stay with a foreign credit card, there were some problems with the card-reading machine and we ended up paying in cash. Overall, a nice little appartment, cute and clean, on a really cool street within walking distance of everything we hoped to see!